Happy TGIW (I have 5 days off starting today...ahhh!). I could get used to these 2 day work weeks, LOL! Are you doing something fun tonight? Mike and I will probably get take out an a movie (don't we sound like real party animals?). I hope to take the tree down today or tomorrow (un-decorating is so not fun!!! ), finish my huge pile of ironing, and hopefully stamp (still have lots of thank you cards to make), make a trip to Costco, and maybe clean the bathrooms (if I feel like it). 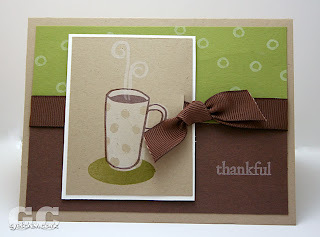 I really like today's card...I cased this one from Nancy R @ iStamp who is an awesome stamper I might add! 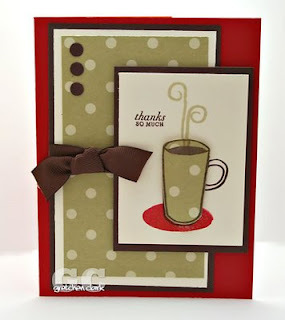 I just loved this color combo (anything with choc chip is a winner in my book!!!). 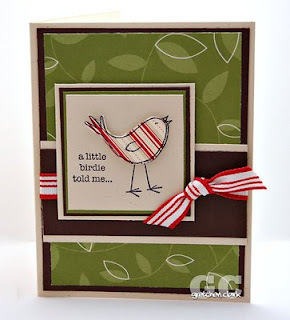 I didn't have the stamp set she used so I made due with the set "A Little Birdie". Have a safe and Happy New Year's Eve!!!! See you next year! I hope you all had a great Monday! Yesterday it was 70 degrees here, so Mike and I went for a walk when I got home from work (I am trying to get back into my regular routine-IT'S HARD! I have been slacking!). That is where the New Year's resolutions come in...right? I am trying to get a head start, lol! I needed a few masculine thank you cards (which is always a hard for me), I tried not to fluff it up too much...but I HAD to add some ribbon!!!! I am still trying to use up my patterned paper (remember I have a hoarding problem). 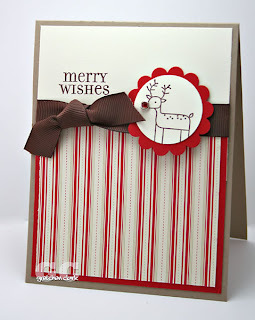 It is a pretty simple card...you know less is more! I also made a quick story board last night of some of my favorite Christmas pictures (I took a ton!!!). Thought I would post our fun Christmas! As you can see, my kids are pretty much trained to open a present... then pose for mom (mamarazzi), I am teaching Nate and Sharon too, LOL! Have a fantastic day!!! Thanks for stopping by!!! Hi all! I hope you had a great Christmas! I cannot believe that 5 days off just flew by...back to work today (but I only have a 2 day work week, so I cannot complain, right?). 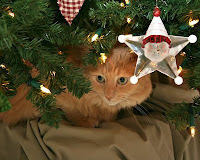 I have lots of Christmas pictures to share this week (just giving you a warning, lol!). Ashley got one of these and let me just say, I am still recuperating from it, lol! my arms are killing me!!! My arms hurt so bad that I wasn't able to stamp on Saturday...can you believe it???? 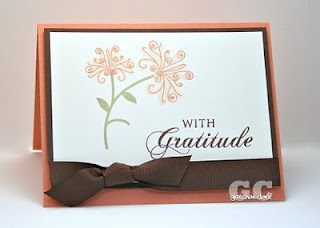 I have several thank you cards to make this week, so it will be a week or two of thank you cards. Santa was pretty good to me *smile* I have a new lens on the way (excited to get that package!!!) and an external flash (which I used Christmas morning, since Josh and Nate were up at 6am and it was still pretty dark), some Papertrey goodies that I purchased with one of my gift cards *happy face*, and a docking station for my iPod (so nice to rock out while I am crafting). Enjoy today and thanks for visiting!!!! Happy Tuesday...(really Friday for me). Today is my last day of work before the holiday...YIPPEE!!! We have our office Christmas lunch today, which is always a good time!!! The celebrating has officially begun! Well I anticipate the next few days to be pretty busy around here...so I am taking a little break from the blog to finish my Christmas preparations. I just wanted to wish you all a Merry Christmas and I will see you back here in a few days with some digi scraping, papercrafting and lots of pictures, I'm sure. Oh yeah...Yesterday I had 23 new subscribers to my blog...I was really surprised to get all those email notifications...Welcome!!! 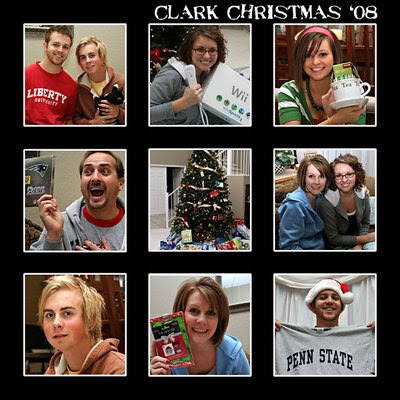 Merry Christmas from the Clark Family!!!! I hope you all had a productive weekend...I am pretty much all set for Christmas minus my grocery shopping (YUCK!!! ), which I hope to tackle today on my way home from work (after a dentist appointment...blah!) two of my least favorite things back to back. Yesterday Mike was having some guy "football" time with some friends, Josh was sick with a cold and taking a nap, so Ashley and I decided to make our annual gingerbread house by ourselves...not as much fun as last year when everyone was involved, but we had fun anyway! Nate took a moment from the game to pose in one of the pictures (I think he was upset that he couldn't eat the candy, lol! not sure why he is making that face). And as you can see from the photos...the frosting was really YUMMY! Thanks for visiting!!! Enjoy today! Happy Friday (6 days to Christmas!!!). I hope you are all ready for Christmas. I think I am just about done in the gift area, just few little stocking items to pick up here and there, I am so glad I don't have to hit the crowded stores for mega shopping...that stresses me out! 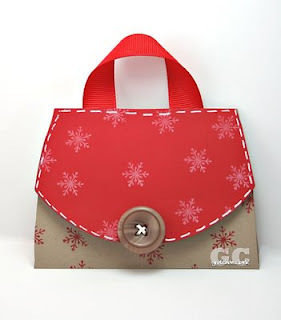 For today's post...I copied this little purse gift card holder (so cute!) from Debbie Olsen, whose blog I visit daily I might add. She is such a talented crafter!!! I love her creations. 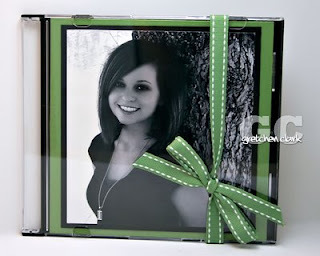 Here is the link to her template...I added a handle to mine with some PTI Pure Poppy grosgrain ribbon. I used a velcro fastener to keep it closed. 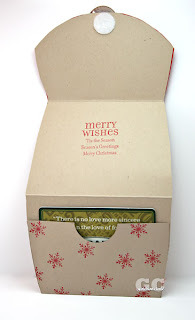 It was pretty easy to assemble, and don't you think it is a cute way to present a gift card? I also got an exciting email yesterday when I arrived home from work...4 of my cards were selected for the June 09 publication of Papercrafts Magazine. I was pretty excited!!!! appetizers for the Youth Group Progressive dinner tonight...should be fun!!! Thanks for visiting!!!! Have a Wonderful Weekend! I won't bore you with my hectic schedule yesterday...Isn't it the most wonderful time of year? LOL!!! With my crazy day...I did managed to make it into the stamp room *hooray* to make a few Christmas cards. Sorry to keep using the same stamp set...but I didn't realize that I sold almost all of my Christmas sets this past summer (I definitely have to order some more before next Christmas!). I don't think I have ever inked up this deer stamp in this set, so it was about time to introduce him to the ink pad! I added a red brad to his nose, and I think he looks pretty darn cute as Rudolph...what do you think? I think I am just about finished with my Christmas shopping, and I hope to get the majority of it wrapped tonight *fingers crossed*, since we are hosting the appetizer part of a progressive dinner for our church youth group on Friday...should be fun! Happy Wednesday! Can you believe that one week from today is Christmas Eve???? Whoa!!!! I am so not ready. So with that being said...quick post for today. I have the day off (yeah! ), I am trying to use up some of my vacation time (good thing I saved it up, lol!). I have lots of Christmas stuff to get done...I might have to enlist my hubby to help out in the wrapping department. 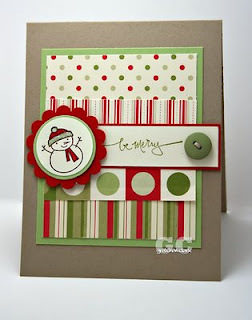 I made another card with my Merry & Bright set. I really like the tree in this set, so cute! Of course I had to add some stickles to give them some bling! Okay...off to tackle my to-do list! Whew! I don't know where my day went yesterday...I had so many plans and didn't seem to get it all done (my usual unrealistic expectations again). I did get all my out of state gifts wrapped and packaged so Mike can take them to the UPS store (glad I pawned that off on him, lol!). I realized a few days ago that I don't have many Christmas stamp sets...I sold a lot of my sets over the summer thinking I would replace them with something new and exciting... but unfortunately, Christmas really snuck up in me this year, so I just had to use what I had. I used my Merry & Bright set from SU! I just love snowmen, and the one from this set is pretty cute. I also used some of my hoarded Designer Paper from last year (also from SU! ), and a button from my stash. And I wanted to post this picture of Pete...my kitty, because I thought it was cute. Okay I am off to work...Enjoy your day! I hope you had a terrific weekend...mine was busy, busy, BUSY! Don't you just love this time of year, lol! I did get several things accomplished and I am about 80% do ne with my Christmas Shopping...now just to wrap it. I had a few hours in my craft room on Saturday (*happy face*), so I do have some Christmas stuff to post this week, just need to sweep/clean off my desk to photograph it...looks like a tornado hit. of the pictures in black and white to adhere to the top. Isn't she a cutie? Here is one of my favorites (although it was really hard to pick). Today I am off from work (trying to use up some of my extra vacation days...cannot believe I have 6 left). I hope to gets lots done and maybe even some stamping (fingers crossed). Then to the post office (arghhh!) to mail some packages to CT. I am so ready for the weekend!!! How about you? My goal today is to get my Christmas cards in the mail! Then hopefully Ashley and I are going to the mall to finish our shopping for our out of state family. Then I can mail those packages on Monday. Where is the time going? Can you believe that Monday is the 15th...which means Christmas in 10 days away...yikes!!! Today's card is one I made for a friend who celebrated her birthday on 12/8 (Hi Cindy). I used my PTI Women of Life set (which in another fav of mine). Okay off to get my envelopes stuffed, addressed and stamped and out of my hands. I was busy all day yesterday with Ashley, we had a fun time together. She needed a Christmas tree, so we looked at a few places and ended up at Joann's (if you are in the market for an artificial tree, they are 50% off this week). She scored with a tree and ornaments for under $60. We then went to JCPenney (since I found an old gift card in my wallet the other day...I like to hoard my gift cards...I know it is a problem...but it was a nice surprise *smile*), and they were having a door-buster sale...I love a SALE!!!!! I also had a coupon for $10 off any purchase of $10 or more, a $20 gift card...I came out of there with 2 sweaters and a necklace and only had to kick in $6~AWESOME! I did also get a few items on my Christmas list...so I felt pretty productive. I needed a sympathy card this week for someone at church who lost her mother. I really do not enjoy making sympathy cards! 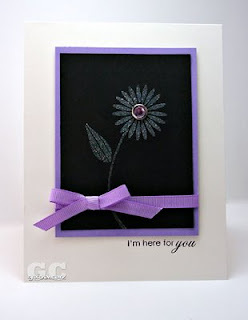 For this one I used some iridescent ice embossing powder to emboss the flower image on black paper...it is prettier irl! I was thrilled to get some happy mail yesterday!!!! I ordered a few books fro m some of Amazon's used book sellers and scored big!!!! I paid $1.99 for 2 of the books and $4.99 for the other! I cannot wait to have some free time to flip through them. a quick post today...here is a card I made for my brother and sister-in-law who are celebrating their anniversary on 12/11 (* Happy Anniversary Tim & Dawn!!!!*). Used my SU! 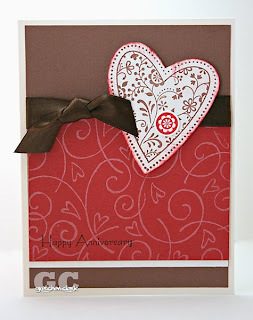 Always set for this one (love the heart in this set), and I pulled out one of my retired background stamps (I think it is called hearts and swirls), I haven't used a background stamp in a while...forgot how much I like them. Last night was our women's Christmas party at church...thanks Cindy! I had a great time visiting with friends and meeting some new ones...I think it was just the thing to get me in the Christmas Spirit...now I have some serious shopping to complete, cards and packages to mail and gifts to wrap. I hope to get it all done by next weekend...not sure if I have unrealistic goals, but I am sure gonna try (and hopefully not stress!). Are you done with Christmas shopping yet? I hope you had a great weekend and Monday. I finally got my Christmas tree decorated (thanks to Ashley and Sharon). I just cannot seem to get very motivated this Christmas season. Not sure why...but it seems like most people I talk to are feeling the same way. 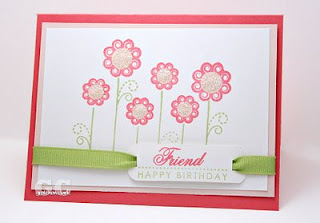 here is a quick card I made for a friend at church, who did something special for me *smile*...Since I have not been real motivated lately...I kept it pretty simple with one of my go-to stamp sets (can't fail with Spiral Bouquet). tonight we have our women's church Christmas party...I hope it will help me start to get into the Christmas mood...it will be fun I am sure...presents to swap, goodies to eat and good friends~a great combination! did you get a chance to elf yourself??? I think it is hilarious!!! (I know...weird sense of humor). it's that time of year...elf yourself, lol! Are you ready for the weekend? I know I am!!! I hope to make a big dent in my Christmas shopping! I am starting to feel a little stressed. Mike and I went to Sam's Club yesterday for church stuff and I was so thrilled to find a few Christmas gifts there (2 people crossed off the list). Here is a card I made for my friend Jackie (hi Jackie), she treated me & Julie to lunch on Wednesday. It was so nice to spend a couple of hours with them, haven't had a girl's day in a while...I don't do that as much as I should! I feel a New Year's resolution coming on, lol! 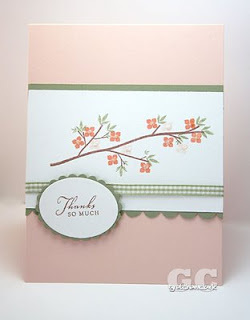 I used my "out on a limb" stamp set and one of my new favorite color combos: Mellow Moss/Blush Blossom/Groovy Guava (really soft and pretty together). I added some Stardust Stickles to the flowers too (hard to see from the photo). I am off to work today! Enjoy your weekend!!!! I do have some cards to post, but still need to edit them...so I thought I would post a picture of my new shirt. I found this online and HAD to get it (it was one of those compulsive buys). This one SO fits me! 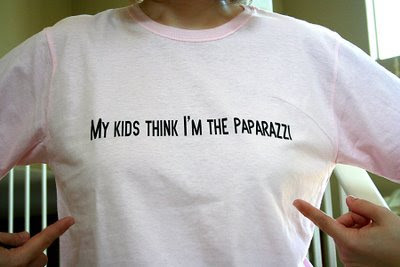 My kids are always complaining that I want to snap their picture all the time...I can't help it...it is a sickness!!!! I didn't tell them I bought it, and we all had a good laugh when they saw it for the first time...I guess they understand my humor, lol! Yesterday we had our carpets cleaned...so now we can get the Christmas tree up (hopefully this weekend). Maybe that will help me get some great Christmas gift ideas. I have today off (switched days off with my co-worker). So I am hoping to get some serious crafting done! Hi all...did you do your cyber shopping yesterday? Not me...I still have lots to do (sigh)...every year Christmas shopping seems to get harder and harder! I am really at a loss on what to get for everyone...hopefully I will get some good ideas soon, since it is already 12/2 (gasp!). 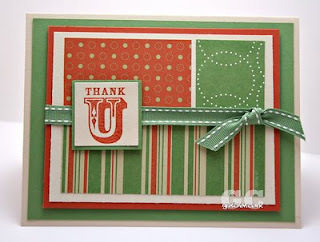 I needed a thank you card for my friend Maryanne who brought dinner over to us after Mike's surgery last Monday. I grabbed my Warm Happiness set (love this one! 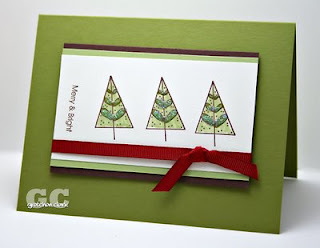 ), and the sentiment from Rustic Branches (both designed by Pine, btw...I just love her style! ), and stamped away. I was pretty happy with the end result (because it is not how I had originally envisioned it, lol!). 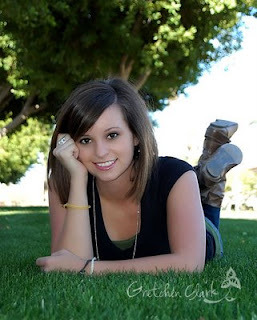 I am hoping to finish post processing some Senior pictures of Sharon (Josh's girlfriend) today. Josh was the photographer and did a fabulous job (I think anyway). I am just tweaking them a bit in Photoshop. I will post a few if I get them done. I hope you all had a wonderful Thanksgiving...Our family enjoyed 4 days of relaxing and enjoying one another (boy the time flew by!). On Friday Ashley talked me into going out for Black Friday (was I nuts!). It was a lot of fun even though I was really tired from going to bet at midnight on Thursday (technically Friday, lol!). We woke up at 5am and hit Target (it was really Crazy! ), now I know why I usually avoid this sort of thing...it was a zoo! I did get some good deals and have at least started my Christmas shopping...which does make me feel good. Not sure if I will participate in Black Friday next year...but I am easily persuaded when this is involved, lol! Ashley and I even stopped in at Costco for our free cookbook (which they give out every Black Friday starting @9am...thanks Vicki & Maryanne for letting us know about that). My sister in law celebrated her birthday last week...Happy Birthday Kyong!!!! Here is the card I made for her. I hope she had a fabulous day! 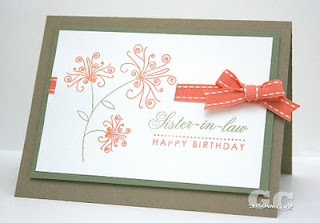 I whipped up this card with my Spiral Bouquet stamp set...which hasn't had much ink lately. Of course I had to add some bling to the flowers with one of my favorite glitter products (Stardust Stickles). 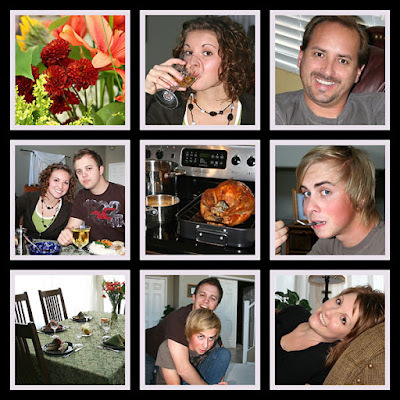 Thought I would include some of our Thanksgiving pic's...we had a fun day! !